Julia Emory was a Maryland-born suffragist who was incredibly active in the National Woman’s Party (NWP) and the fight for women’s suffrage. She gave up her work with the National Women’s Trade Union to work for suffrage in 1917. She grew up in Baltimore and her father was a Maryland state senator, D. H. Emory (Library of Congress). Emory was described as small in stature but was “active, insistent, and persistent in inverse ratio to [her] size” (Inez Haynes Irwin, 336). Emory was first arrested with twelve other women on September 8, 1917, when protesting at a parade of drafted men. The women picketed with a sign that read, “Mr. President, How Long Must Women Be Denied A Voice In the Government That Is Conscripting Their Sons” (Irwin, 245). Emory was sentenced to sixty days at the Occoquan Workhouse, where conditions were deplorable. Several months later, in November of 1917, Emory protested the imprisonment and treatment of NWP leader, Alice Paul. She and the other suffragists believed Paul should have been treated as a political prisoner with the requisite privileges, such as visitors, correspondence, and access to reading material. On November 10, 1917, Emory and forty other women picketed the White House on Paul’s behalf. They were arrested, tried on November 12th and charged with obstructing traffic (Irwin, 257). The women plead not guilty and argued that they were practicing their Constitutional right to peacefully assemble (Irwin, 258). The women were released without sentencing. Only two days later Emory was arrested again in protest of Paul’s imprisonment. This time she was charged with unlawful assembly and sentenced to thirty days in prison. She served her time once again in the Occoquan Workhouse. 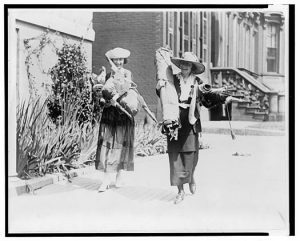 Upon being committed to the Workhouse on November 14th, Emory and the other suffragists began a hunger strike to protest not being treated as political prisoners. In the early hours of November 15th and what would later be called the Night of Terror, Emory and her counterparts were beaten and eventually subjected to forced feedings. Lucy Burns that night was shackled by the wrists and chained to her cell with her hands over her head. Emory in a sign of solidarity raised her hands to the same position (Emory affidavit). In less than ten days, a judge decided they had been illegally committed to Occoquan and should be remanded to the District Jail. They were released on November 27th. Emory proved her loyalty many times over and remained a steadfast suffragist throughout the National Woman’s Party campaign. Sources: Robert P.J. Cooney, Winning the Vote: The Triumph of the American Woman Suffrage Movement (Santa Cruz, Ca; American Graphic Press, 2005).